Golfers walking off Hole 12, Lakowe Golf Club’s signature hole, during the 2018 Lakowe Lakes Golf Club Classic. Former Professional Golfers’ Association of Nigeria (PGAN), Emos Korblah, contributed immensely to the success of his team, which consisted of Omoboyede Olusanya; Kola Ashiru-Balogun and David Maji, at the 2018 Lakowe Lakes Golf Classic. Not only did Korblah of Achimota Golf Club, Ghana enjoy fame with the team, he also fought his professional colleagues to a standstill to emerge the winner of the pros’ event with the three under par he shut over 36 holes. Still in the pros’ event, Aminu Mustafar of Ilorin Golf Club, and Nojeem Sofela of MicCom Golf and Country Club, Osun State finished joint second. Sofela, who missed the diadem by the skin of his teeth, was in top form two years ago, when he helped his team to win the tourney, then christened Lakowe Lakes Golf Club Anniversary and Independence Day Pro-Am. Sunday Odegha, a past winner of the tournament finished in third place in the pros’ event, which featured only top 20 PGAN members. 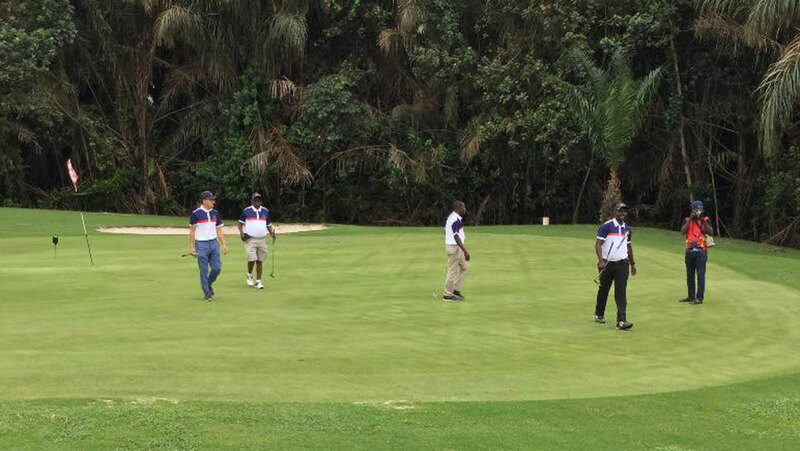 In the competition, which format was better ball Stableford (full handicap allowance) and scoring was lowest two of the group, including that of the professional, Friday Adache of Ilorin Golf Club, helped his team made up of Ikechukwu Boniface Ozoh, Kim Jong Keun and Olajide Aworanti, settle for the second place. According to him, “It’s fun’s to tie the country’s independence celebration with the club’s anniversary, which is what this tourney does.